I absolutely LOVE snowflakes!! They make me happy! I guess it is due to the fact that I grew up in Ohio where it snowed all winter long. Now, I'm on the coast of Virginia where we might get one good snowfall a year. I've been here for 20 years and still get all giddy and excited to see it snow! Anyway...I LOVE snowflakes, snowmen & snowwomen and all things snow! I recently received my new Serene Snowflakes set (found in the Holiday Mini Catalog available to purchase from today). I've been looking at the large snowflake in the set. I'm seeing several different ways to use the different graphic designs in the snowflake. Over the next several days, I will show you a few different ways to use that one snowflake. You wouldn't even know this was the large snowflake. This card is my submission for SCS's Saturday's Inspiration Challenge #195 My inspiration was drawn from this Metal Scroll Wall Art found on the Creative Wall Coverings site. I used my stamp-a-ma-jig to line up the snowflakes. 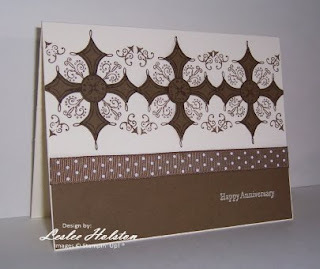 They are stamped on a Very Vanilla card base in Soft Suede. I then stamped three more on Soft Suede cs in the same color. I cut out the "celtic cross-type" center design and popped them up on Dimensionals. The sentiment is from Teeny Tiny Wishes, stamped in Very Vanilla Craft ink on Soft Suede. A length of Soft Suede Polka Dot ribbon is wrapped around that and then it is all adhered to the Very Vanilla base. It's amazing the different items/things that can inspire you creatively. I hope you like it? I love the fact that I am able to use, of all things, a snowflake in a way that is outside-the-box! Now that's one flake I will use year round!! That makes me very happy!! Thanks for stopping by today. Remember to check back all week for more use of the same snowflake.